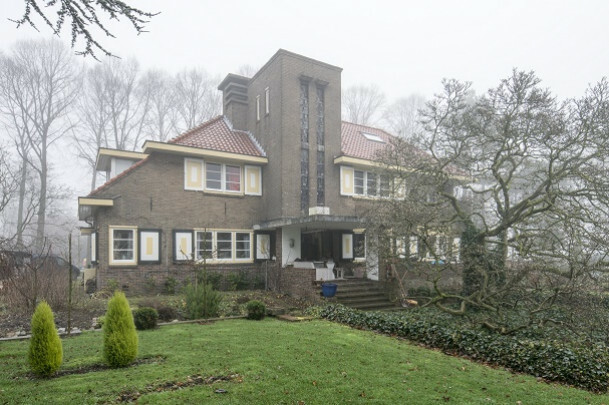 In 1926, Diederik Visser (1899-1977) from ’s-Gravendeel was appointed municipal architect to Schoonhoven (both are in Zuid-Holland province). When commissioned privately to design a house for B.J. Teyinck, a civil-law notary, he once again enlisted the services of Vilmos Huszár, who had designed the leaded windows for his municipal hall in Strijen. Huszár designed a variety of transom lights and two narrow, high windows in the stairwell and prescribed the colours black, white, red and sandy yellow for the interior. Part of the fireplace in the living room has been removed. Besides buildings, Visser in his capacity as municipal architect also designed benches, signposts and other street furniture in a modernist idiom.